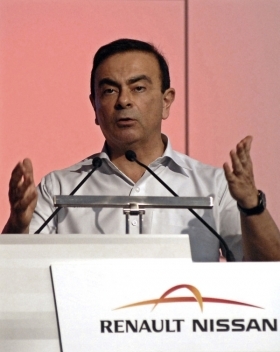 ABU DHABI (Bloomberg) -- Renault-Nissan plan to increase production in South Korea to cut their reliance on Japan as a manufacturing base as the yen strengthens, CEO Carlos Ghosn said. Renault said Aug. 10 it was exploring other ways to expand its business in Southeast Asia after dropping out of the bidding for Ssangyong Motor Co., the South Korean carmaker operating under bankruptcy protection. Korea's Renault Samsung Motors Co., 80 percent owned by Renault, operates a plant in Pusan, Korea, that exports the Nissan Sunny to the Middle East. Nissan, Japan's third-largest carmaker, is exporting 50,000 cars annually to the Middle East from the South Korean plant, Ghosn said. Renault separately is using the factory, with maximum capacity of 240,000 vehicles, to ramp up production of a “Latitude” version of its SM5 sedan for export to the Middle East and Europe. Every one-yen increase in the Japanese currency against the dollar reduces Toyota Motor Corp.'s annual operating profit by 30 billion yen ($354 million), according to the world's biggest carmaker. Sony Corp., which generates more than 70 percent of revenue outside of Japan, says it loses about 2 billion yen of annual operating profit for each yen gain against the U.S. currency. The yen has advanced 14 percent this year based on Bloomberg Correlation-Weighted Currency Indexes, the biggest gain among the currencies of the developed world. The yen rose as high as 83.60 per dollar on Aug. 24, the strongest since June 1995, from 2009's low of 101.44 yen reached in April that year. The currency gained to touch 105.44 per euro, the highest since July 2001 and up from 134.38 in January. Nissan plans to sell 200,000 vehicles in the Middle East and North Africa in the fiscal year through March 2011, Ghosn said. The figure includes 130,000 units for the six countries making up the Gulf Cooperation Council. Sales in the Middle East, North Africa and India grew by 27 percent in August from a year earlier, Gilles Normand, vice president for the region, said. Nissan continues to export cars to Iran “for the time being” and is cooperating with the Japanese government on sanctions on Iran from the United Nations, Normand said.